I start quite a few posts that hang around in draft mode. 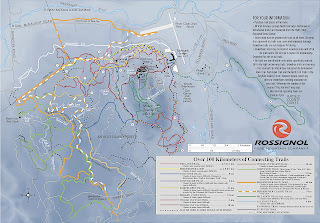 I'm not sure how I lost this one about an old Wisconsin cross ski resort; it seemed about done. Maybe I wanted to add some links or photos. 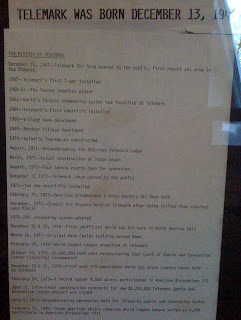 So it was unpublished today when, while putting our winter plans together, I learned that the Telemark Lodge had closed on May 5th, 2010. 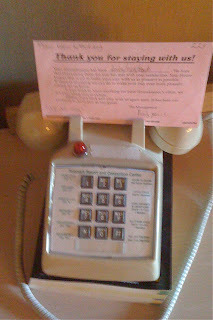 The Telemark Lodge was on its last legs when we stayed there last February, but for my screwball family, it worked. 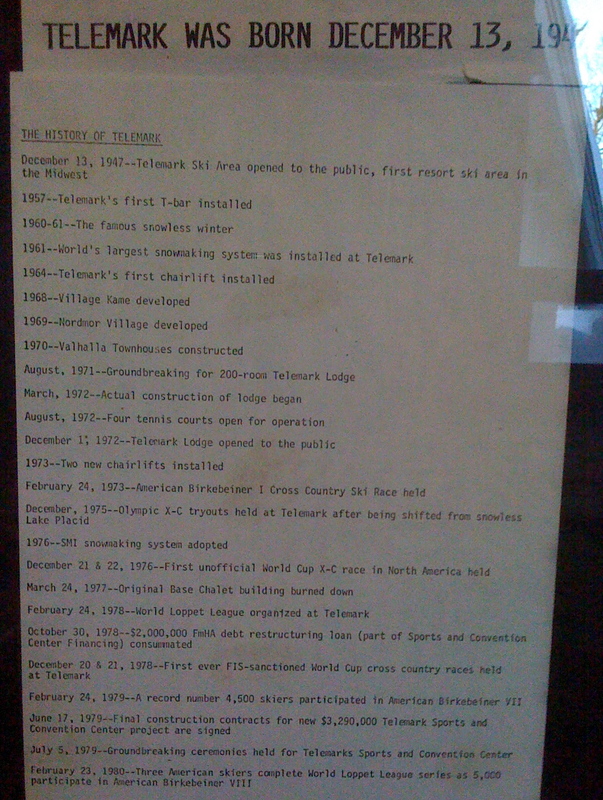 Telemark lodge was built in 1979. Even then it was a crazy idea. The Trapp Family lodge has struggled in a picturesque region with millions in easy driving distance, the Telemark lodge is in the northlands of Wiscosin. How remote is this area? In the 1970s wolves were thick on the ground, and today they're coming back - along with cougars. There's still no cell service in these parts. 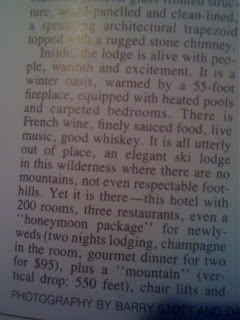 The Lodge had its good years. In the late 70s there were still young, active boomers who'd grown up in the cold snowy 70s. The combination of a young population accustomed to snow sports gave the year round resort some good years. Not too many good years though. The climate changed, air travel to Whistler, Snowbird and Denver became cheap, we boomers bloated, and, until this most marvelous winter, cross country skiing has been all but forgotten. So what do we think of the place? Thing is, we know how it all turns out. Everything gets entropic and dead - or just dies. All of human history becomes a thin layer of contamination in old crust. The sun runs out of the good stuff. The sky empties out. Only entropy wins, so it's all about the tale you tell in the time you get. 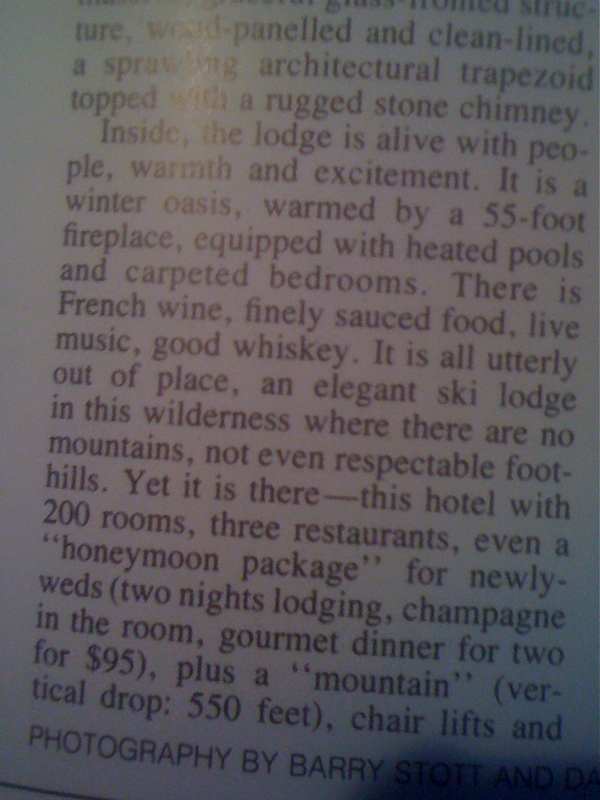 The Telemark lodge made a good story of it. The lodge is full of folk history and stories that end in the 1980s. The wall maps show a "colliseum" with indoor tennis that closed twenty years ago. Signs point to long closed retail areas and missing "waxing tunnels". The massive fireplace caught fire 3 years ago, and has been silent sice. 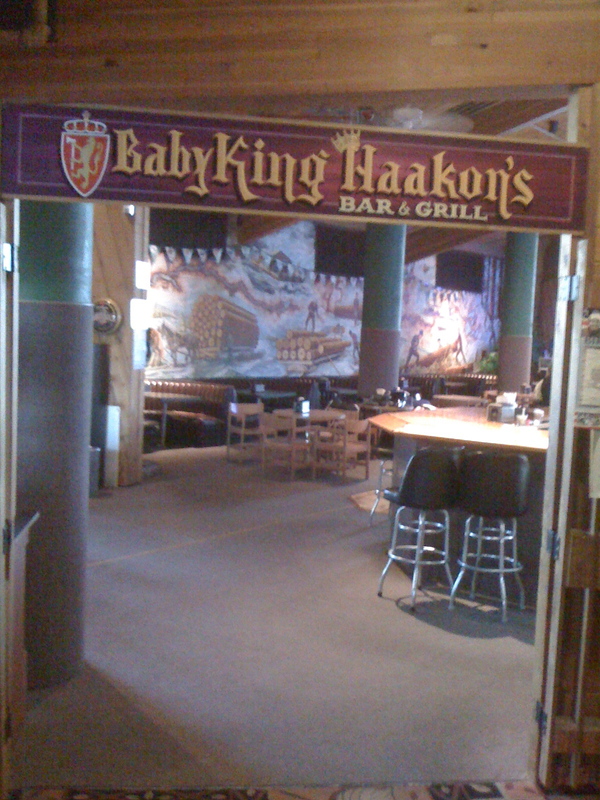 The old waxing rooms are now game rooms and a viking-themed bar aimed at heavy drinking snowmobilers. 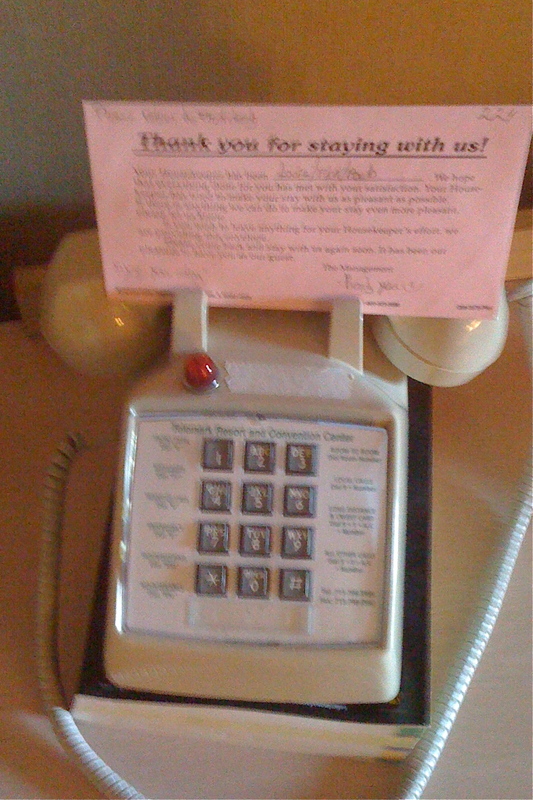 There's net access in the lobby only, no mobile service anywhere, and 30 yo room phones that will outlast analog landlines. It's a museum you can sleep in. As a place for our family to sleep, I ain't got no complaints. Sure the sliding patio doors don't always latch, but the hotel provides wooden security poles on request. The snow making ended two years ago, but this year nature's been atypically kind. The rooms are fine for the price (don't pay list though), the showers have hot water (though the bath plug is broken) and the swimming pool and hot tub are, honestly, just great. The friendly staff are old enough that I feel reasonably young, which helps make up for my 10 yo being surprised that I'm 50, not 60. The trails this year are great. 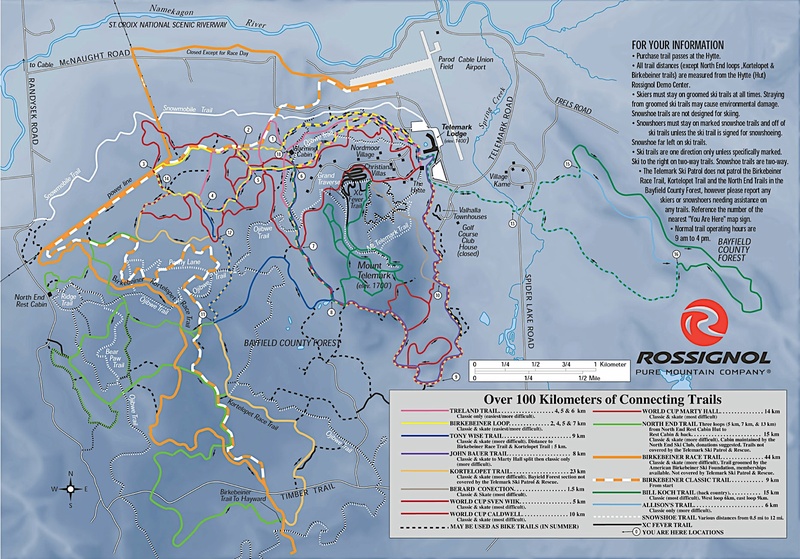 True, they are mostly groomed for skating skis and I'm a guy who prefers single track trails winding in the woods, but snowways are popular these days. Can't be avoided. The terrain is beautiful, and if you're lucky you might see a wolf (hopefully not cougar tonsils though). The owners are trying to unload the place, to find someone who can put millions into the lodge and maybe make a business of it. The odds seem long, but I hope they pull it off. Maybe some eccentric billionaire will decide to give entropy a quick kick. After all, the same trends that killed the old resorts may be going in reverse. Our increasingly chaotic climate means that even Whistler can't reliably host the Olympics, so living in the snow shadow of Superior is going to be important again. No matter what the climate does, Superior will be cold for centuries to come. I hope I was right about the last bit. I may have overestimated the resiliency of Superior -- this year it was swimmable. 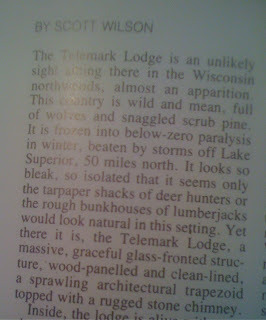 Update 3/8/11: The Telemark Lodge rises from the grave. Hard to believe, but it may be back. Update 10/17/11: Although it was supposedly resurrected months ago, there's now a web site. I think it was only open for events for a while. 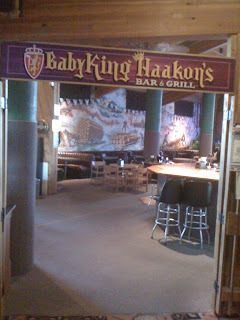 Update 1/30/12: We dropped by while staying at a nearby resort. It's looking good. The old fireplace is working again, the pool looks fine. Update 3/2018: It died again. I think for good this time. I saw the fading structure on a mountain bike ride in 2016. 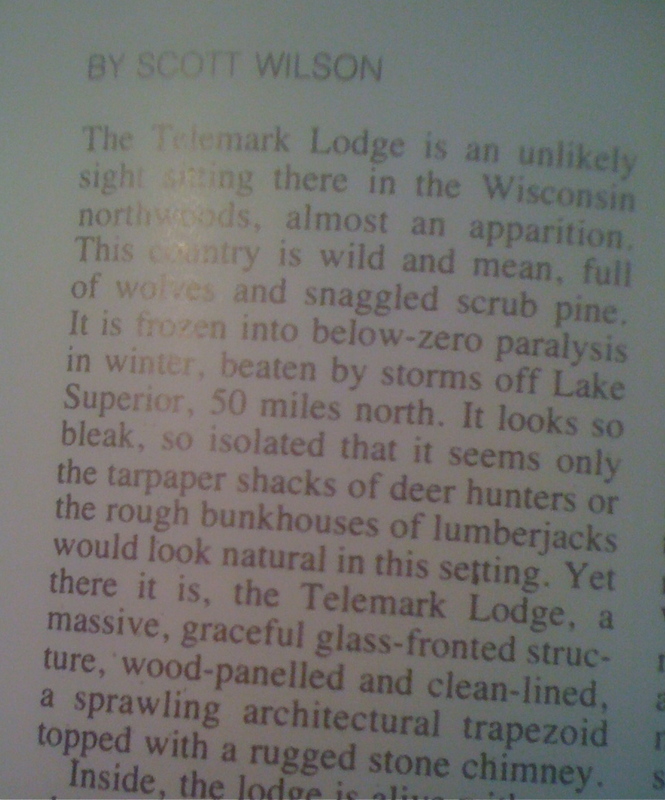 Sorry, but I live in the Telemark Lodge area and the woods were not thick with wolves in the 70's. May have been the odd one around in the 50's however. I played in a band at the lodge in the mid 60's while I was still in High School. Sorry to see the old place go. Just sold today (10/16/13) for a little over $900,000. Sold two years ago for over 2 million. Times have changed. Thanks for the article. Sorry, but the wolves wer not "thick on the ground" in the 70's although there may have been the odd one around in the 50's. I played in a band at the lodge in the mid 60's while still in high school. Sorry to see the old place fall apart. Sold today (10/16/13) for a little over $900,000. Sold back in 2011 for a bit over 2 million. Times have changed. Changing climate doesn't help value. Wonder what new owners will do.